Raquel Gonzalez is no stranger to farming – she grew up in the Dominican Republic countryside where her father was a lifelong farmer. But when she and her husband Joe decided to launch a full-fledged commercial farm in the middle of Jersey City, Raquel knew she needed some expert business advice. She found that advice and more when she enrolled in a recent UCEDC Entrepreneurship 101 training program that was sponsored by the Hudson County Office of Minority and Women Enterprises. During the six-week program, she learned how to realistically assess her business concept and assumptions and determine if she was personally ready for small business ownership. Raquel’s business, Lonchando Farms, will produce fresh vegetables and herbs and leafy greens, such as lettuce, spinach and micro greens. Micro greens are tiny vegetables rich in nutrients that can be easily grown indoors in about two weeks and are primarily used in fine dining restaurants to enhance the beauty, taste and freshness of their dishes. With a rapidly growing “foodie”scene in Jersey City, Raquel believes she’ll have plenty of customers interested in these crops. Raquel is currently negotiating with the City to locate her farm on city-owned property, where she plans to install a hoop house infrastructure (a series of large hoops covered by thick plastic) for year-round production. Her farming methods will be strictly organic and will incorporate aquaponics – a process that combines aquaculture (raising fish) and hydroponics (the soil-less growing of plants) in one integrated system. Raquel and Joe are passionate about providing the local community with healthy, fresh food - an option sorely lacking in the city. Raquel knows first-hand how life-changing fresh food can be – she suffers from Lupus and was facing a complicated regimen of medications when she decided to embrace a lifestyle of eating as much organic and freshly prepared foods as she could. Now feeling strong and healthy, Raquel is eager to share her experience and bring her crops to local farmers markets and Community Supported Agriculture (CSA) members . 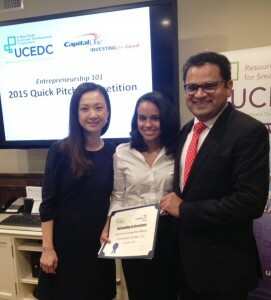 Raquel’s passion and sound business plan turned out to be a winning combination in UCEDC’s recent annual Quick Pitch Competition. Quick Pitch is a collaboration between Capital One Bank and UCEDC and is designed to give fledgling entrepreneurs a chance to hone their business ideas with the help of experts from the Bank. Participants receive cash prizes from Capital One. Raquel was paired with two mentors from Capital One Bank - Ken Shah and Stephanie Yi - who helped her prepare for the final competition. Her five-minute presentation took top honors from an independent judging panel, which praised her keen understanding of the target market.